It would appear as a surprise to many that until now, America has not imposed a travel ban to North Korea. The reclusive country is one of the most dangerous countries in the world, and yet Americans who are willing to take the risk can visit the country as they please. Of course, it is expected that not many Americans spend their holidays in a country that is hostile towards the US. However, there are plenty of thrill-seekers out there that want to see what the fuss is all about. Though the US government has not banned visits to North Korea, people must realize how crazy dangerous it is. Today, there are many travel tours that offer Americans such opportunities to visit North Korea. In fact, many would be surprised to find out how easy it is to get in the socialist state. Curious travelers can just type in “North Korea tours” on their web search, and a long list of travel companies are displayed on the web page. A few clicks and a payment transaction later, people can already find themselves on a plane headed towards the land where Kim Jong-un is revered. This is exactly what college student, Otto Warmbier did last year when he decided to take a trip arranged by Young Pioneer Tours. The 21-year old’s trip took a drastic turn when North Korean officials caught him at the airport, stealing a propaganda poster. Officials immediately arrested the American, and detained him, eventually giving him a 15-year hard labor sentence for his crime. Seventeen months later, North Korea released Warmbier, however, not in the same condition as he was arrested. To the surprise of his family, Warmbier was in a coma due to unknown reasons. His medical condition remains to be a mystery despite North Korea’s claims that he suffered from Botulism the day after his arrest. American doctors that attended to him say that there is no trace of Botulism in his system. Weeks after his return, Warmbier’s death was announced. Many have been angered by this, accusing North Korea of murdering Warmbier. News about Donald Trump calling Kim Jong-un’s leadership a “brutal regime” have also been reported. Clearly, the US must take action as a warning to North Korea that they cannot get away with what they did. Lawmakers have even gone as far as proposing to finally impose a travel ban to North Korea. 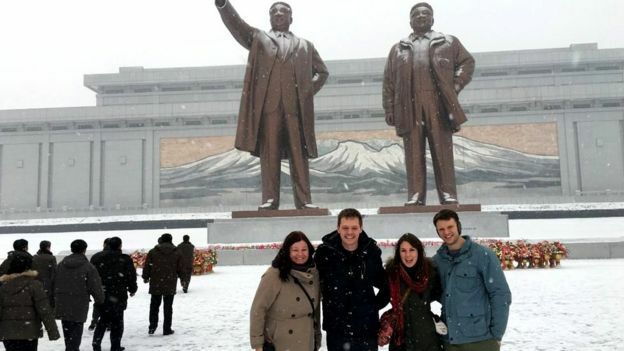 Following Warmbier’s death, Young Pioneer Tours stopped offering their services to Americans. However, the man behind the company has denied responsibility for the incident. It was reported that British businessman Gareth Johnson fled North Korea just days after Warmbier’s arrest. Weeks after the arrest, he also left his Chinese wife and kid and went to the Philippines where he started a new business called Gross Negligence Tours, catering to all-male customers looking for a “fun time” in the country’s red light district. Although Young Pioneer Tours has revoked their services to US citizens, this has not stopped other travel agencies from doing so. Several agencies such as Secret Compass, Koryo Tours, and Lupine Travel still believe that there are still Americans who want to visit North Korea in spite of recent news. The State Department has made it clear, however, that Americans are strongly discouraged from traveling to the country. Also, being in a group tour will not stop authorities from arresting tourists who break the country’s laws. North Korea’s unstable regime and undeniable hostility towards American citizens will always prevail in spite of assurances from travel agencies that their tours are safe. North Korea may be beautiful as attested by those who have visited that country, but are you really willing to risk your safety for it?